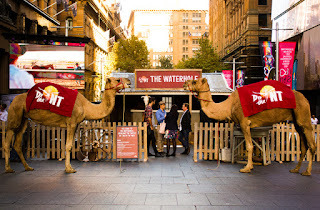 Experience a little piece of the Northern Territory right here in Melbourne, as Federation Square turns into a mock outback scene for two days at the start of April. The Territory comes down to Victoria, to immerse Melburnians into Top End culture. Enjoy a cold beer from The Waterhole; an outback inspired pub, all the while feasting on some of NT's well known pub grub cuisines. Discover the Territory's adventure-fuelled experiences, and become acquainted with the indie music scene. Cool off your outback experience with some refreshing Mango ice cream, or fill your bellies with some Northern Territory Barra and chips, Crocodile Poppers or Red Centre tarts for brekky. Food and drink aside, would you ever imagine you would get to meet some of the NT's well known creatures? In the Northern Territory pop up, you can familiarise yourselves with camels and baby crocs. Yes, right in the heart of Fed Square! Virtual reality also brings the Top End to Melbourne. Using state-of-the-art Samsung Virtual Reality headsets, you can take a journey through the NT's spectacular scenery via Kakadu and Katherine. On Friday April 1, Top End indie band, 'At the Dakota', and NT artists, David Crowe and Andrew Langford, will play from 6.30pm to 9pm, showcasing some of the nightlife on offer that only an NT experience can offer. Best of all? It's FREE.